Campalabo Islet is a very charming white sandbar located some twenty minutes from Barangay Tajao, Pinamungajan Municipality, Cebu Province. Strictly speaking, it is not an islet since it only shows off its sparkling beauty during low tide. Therefore, it should be a sandbar, which always sounds more attractive and enticing to me! LOCATION: Campalabo belongs to Barangay Tajao, Pinamungajan Municipality; about less than 3 hours from Cebu City, Philippines. From this islet (or sandbar), you will have an unhindered view of Negros Island’s famous Mount Kanlaon. Briefly (for the sake of non-locals) Mount Kanlaon (sometimes spelled as Kanla-on or Canlaon) is an active volcano of Negros and the highest in Negros and the whole Visayan Region. It is about 8 thousand feet above sea level. Mt. Kanlaon Natural Park is famous among mountain climbers, but it is highly restricted for such activities. 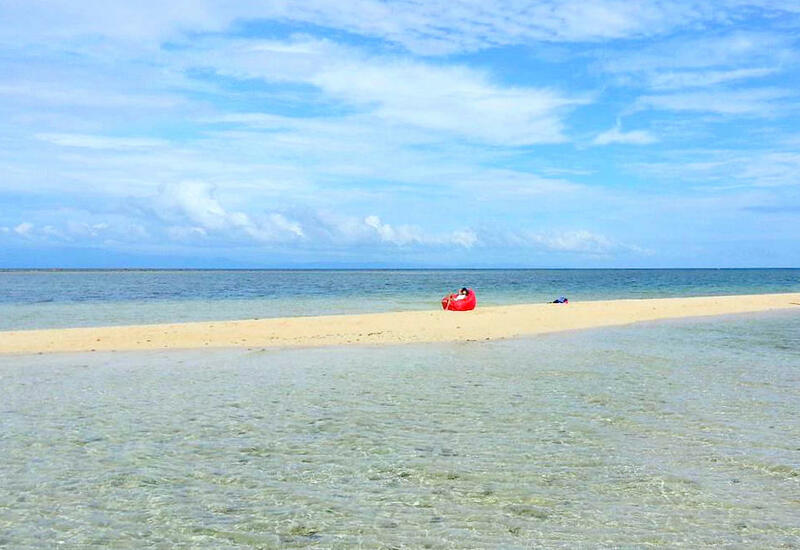 Also, you will have a stunning sight of Tañon Strait from Campalabo Sandbar’s vantagepoint. 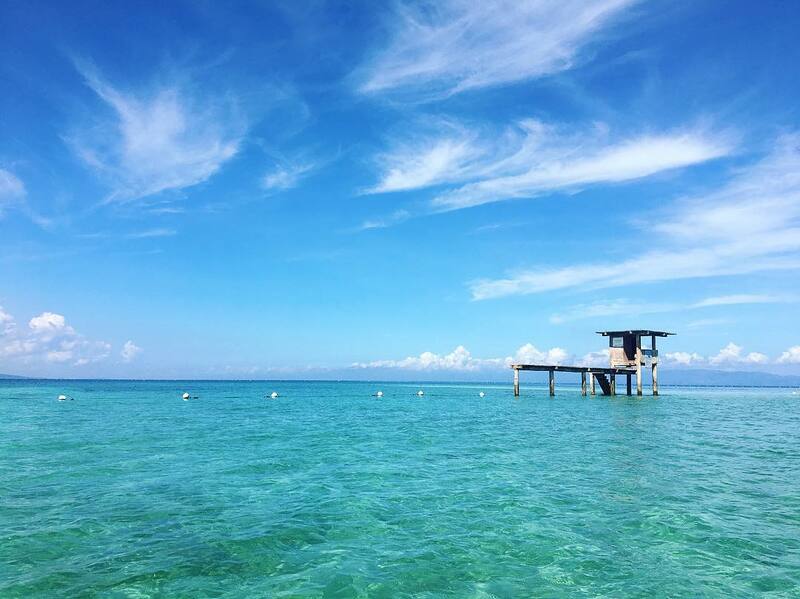 This strait is the body of seawater that separates the islands of Negros and Cebu Provinces in this Visayan region. The channel is about 100 miles long, and it links the Visayan Sea in the north and to the Bohol Sea in the south. Therefore, when you are on top of Campalabo Islet, you will have some hints of how this physical geographical feature looks like. Moreover, you will also find that there is watchtower from where the sea watchers can have a better view of the whole spectacles. This strip of white sandbar is simply amazing and irresistible among beach lovers. You can do lots of activities including beach volleyball, swimming, sunbathing, strolling and picking up shells, boating, and all sorts of beach games you can think of. Being part of a protected marine sanctuary, snorkeling is another exciting thing you can do here. Alternately, you can do a full snorkeling activity at the marine sanctuary located nearby. This rock is another value to the attraction of the area. Locally known as ‘paril’ (which can be translated into English language as a ‘pile’ of solid materials such as stones, concrete wall, and similar blocks). This name fits the description of Paril which appeared in 1951 after a devastating typhoon code-named ‘Amy’ hit the country. Amy was the worst typhoon ever recorded until the super typhoon Yolanda topped that record. Despite that destructive typhoon, another form of life appeared after Paril was born. Paril is a 2-kilometer rock formation which turned out to be a temporary home or stopover among migratory birds from Olango Island (an island celebrated for its sights of migratory birds and designated as a protected area). Now that you have some additional ideas about Campalabo Island, you may continue below to find out how to get there quickly – when you are ready! As there is really nothing free in this world (Maybe except air – hmm… oxygen is not free either!). just saying that you may incur some amounts for your travel to this sandbar. I mean, you cannot go there straight as you should go through a regular process: taking transports for a fee, entrance fee, among others that support people’s livelihood as well. Boat Fare: 150 Pesos per person for a round-trip basis. The minimum of boat passengers for that fare is six (6) passengers. You will be asked to pay around 200 Pesos if you hire them with less than the set minimum number of passengers. I’m sure that’s a flexible locally agreed arrangement and not a law. First, the best time to be there on the island (again, a sandbar) is before 4 PM. That’s because it is when the sandbar is showing off its pearly and white sandy beauty. But you may come as early as you want before the sandbar emerges. Second, you can then have your dinner, after your activities, in the mainland which is just about 20 minutes from the islet. Alternately, you can bring your own provisions from where you are coming from. Another suggestion is to purchase your provisions at the Sari-Sari stores in the area. NO, there is not store on the sandbar by the way! Third, you may bring your own portable tables, folding bed, and lightweight chairs, towels, and anything convenient to carry around. NO, there is no cottage on the islet! And, you are NOT allowed to pitch a tent on the sandbar either! As a responsible ‘nature lover,’ you should bring back with you all sorts of leftovers and garbage and dispose of them properly. Campalabo Islet is located in Barangay Tajao, Pinamungajan Municipality, Cebu Province. Going to this southern beach and sea attraction takes about less than 3 hours from Cebu City. Take a bus from South Bus Terminal in the city and get off at Barangay Tajao specifically at Bugsay Resto Grill (hopefully they are doing well and still in existence as of this writing). The bus fare is about 80 Pesos, and double that fare when you return to the city. Ask any local, such as a store or restaurant operators (or staff) to give you specific directions. The boat (bangka) ride takes around 20 minutes from the mainland to the sandbar area. Another best suggestion is to head to the municipal hall and ask them to facilitate your trip to the islet. Similar as above, you will be put on an outrigger boat at Barangay Tajao’s wharf. Hope this is useful for your adventure on that amazing islet. Thanks for reading and please ‘like’ if this helps.